Edward and his brother Richard's fate after their disappearance remains unknown, but the most widely accepted theory is that they were murdered on the orders of their uncle, King Richard. 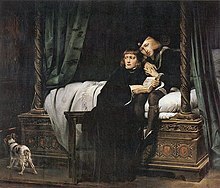 Thomas More wrote that the princes were smothered to death with their pillows, and his account forms the basis of William Shakespeare's play Richard III, in which Tyrrell murders the princes on Richard's orders. Subsequent re-evaluations of Richard III have questioned his guilt, beginning with William Cornwallis early in the 17th century. In the period before the boys' disappearance, Edward was regularly being visited by a doctor; historian David Baldwin extrapolates that contemporaries may have believed Edward had died of an illness (or as the result of attempts to cure him). In the absence of hard evidence a number of other theories have been put forward, of which the most widely discussed are that they were murdered on the orders of the Duke of Buckingham or by Henry Tudor. However, Pollard points out that these theories are less plausible than the straightforward one that they were murdered by their uncle who in any case controlled access to them and was therefore regarded as responsible for their welfare. An alternative theory is that Perkin Warbeck, who claimed to be a pretender to the throne, was indeed Richard of Shrewsbury, Duke of York as he claimed, having escaped to Flanders after his uncle's defeat at Bosworth to be raised with an aunt. ^ Chisholm, Hugh, ed. (1911). "Pembroke, Earls of" . Encyclopædia Britannica. 21 (11th ed.). Cambridge University Press. p. 79.